The City of Grand Forks began operation of its new Wastewater Treatment Plant (WWTP) in 2003 to treat the significant biological loads and high volume wastewater flows generated by local agricultural processing industries. 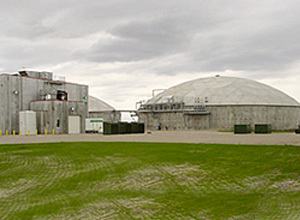 Although the City of Grand Forks intends to store the biosolids produced by the WWTP in an existing lagoon under authorization from the United States Environmental Protection Agency (USEPA), the implementation of a biosolids management strategy was required to avoid the associated ramifications of having the lagoon classified as a surface disposal site. To avoid this classification, the USEPA allotted the City of Grand Forks three years from WWTP startup to develop and implement a viable biosolids management strategy. Recognizing the balance between specialized expertise and local coordination, the City of Grand Forks retained AE2S and Black & Veatch to complete a Biosolids Management Facilities Plan. Since the Facilities Plan required completion prior to having WWTP operational data available, biosolids production was estimated based on wastewater contributions from domestic wastewater loads and major industrial loads. Considered biosolids management strategies included various combinations of aerobic digestion, mechanical dewatering, air or thermal drying, composting, landfill disposal, and land application concepts. The Facilities Plan concluded that the implementation costs over a period of 20 years of the concept of mechanical dewatering, air drying, and landfill disposal is five percent less than the concept of aerobic digestion, mechanical dewatering, air drying, and land application. However, biosolids produced by the latter concept could also be disposed of at the landfill, which is considered a non-economic benefit and could justify the increased implementation costs. Due to the costs associated with implementing either of the recommended concepts, the City of Grand Forks elects to delay the implementation of a biosolids management concept in favor of blending raw wastewater with the biosolids in a lagoon. During the period of time provided by the interim wastewater/biosolids blending strategy, the City of Grand Forks has the ability to gain actual WWTP operational data, and financially prepare for the implementation of a preferred long-term biosolids management strategy.